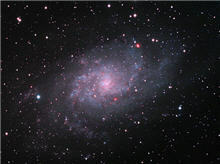 Our Milky Way galaxy is a member of a larger group called the Local Group. The local group is also a part of a larger cluster, but that is covered in the Cosmology section. The sizes are not to exact scale, but does demonstrate that spiral galaxies are larger than elliptical galaxies.